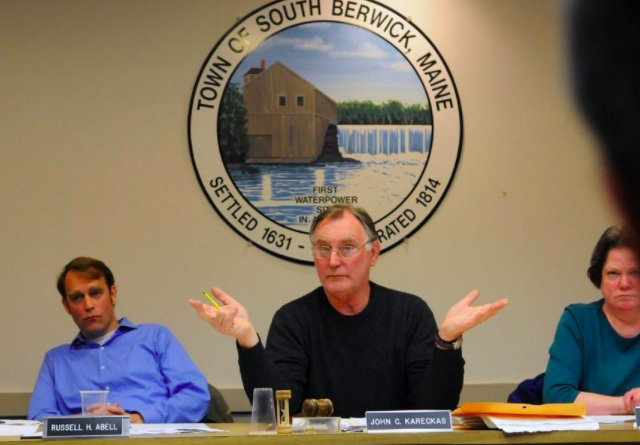 South Berwick Town Council Chairman Jack Kareckas, with town councilor Russ Abell, left, are seen in this Seacoast Online file photo. Chairman Jack Kareckas said carbon tetrachloride was discovered in a well recently dug by a Hooper Sands Road homeowner. Tests found the water contains 12 parts per billion of tetrachloride, a known carcinogen, above the federal standard of 5 ppb. The council was informed of the well’s contents on Monday. The same contamination issue plagued the Hooper Sands area in the late 1990s, according to Kareckas. “For a couple of years, people in the area had to drink bottled water,” he said. “It is a possibility,” Councilor Russell Abell said. If this is the case, Kareckas asked the council to consider establishing a groundwater protection zone. Such an ordinance would require residents to use water supplied by the town’s Water Department. In addition, any building permits issued for the Hooper Sands area would require the installation of town water. Councilor John James agreed. “I’d rather let organizations that own this matter, own it,” he said. Town Manager Perry Ellsworth said “testing of other (water) wells in the vicinity” will be undertaken by the town. Ellsworth will also reach out to DEP to determine next steps on dealing with the contamination. For more coverage of the South Berwick Town Council, visit seacoastonline.com.